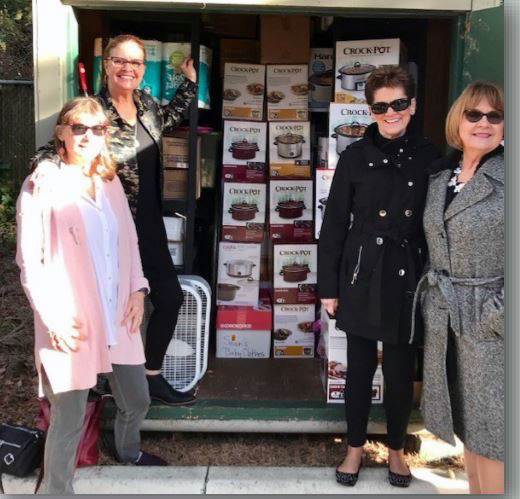 Pictured with Crockpots from left to right: Kathleen Corbiere, Julie Bronemann, Pam Brandon, Nancy Knox. Photo courtesy of Mill Creek Women’s Club. By Marge Rhodes, Mill Creek Women's Club Publicity Chair. Every January, the Mill Creek Women’s Club collects crockpots and non-perishable food items from its members at its General Membership Meeting. The crockpots and food items are then delivered directly to the YWCA Pathways for Women shelter in Lynnwood. For 2019 the Club donated 31 crockpots! The crockpots and food items were loaded into members’ cars and delivered to the shelter immediately after the luncheon. Crockpots are a convenient way for the residents to prepare their own family’s meals. The YWCA’s Lynnwood shelter serves women who are homeless or have been displaced by domestic violence. In addition to housing, the residents are provided assistance in job training, job searches, counseling and continuing education at local community colleges. Donations from individuals of household items and personal products (toothpaste, toothbrushes, hand soaps, shampoo and personal hygiene products) are gladly accepted during office hours. In addition to its donations to the Lynnwood shelter, the Mill Creek Women’s Club continues to support the YWCA Pathways for Women through its year-round operation of the Working Wardrobe boutique at the YWCA Everett office. Clothing donations to the Working Wardrobe can be made directly by bringing them to the Everett Regional Office of the YWCA at 3301 Broadway.